The New York Yankees have a good problem on their hands, the team has too many good prospects and not enough positions to play them all at. The Yankees have Gleyber Torres scratching at the door of the Major Leagues presumably at third base leaving their next best third baseman to potentially learn a new position. 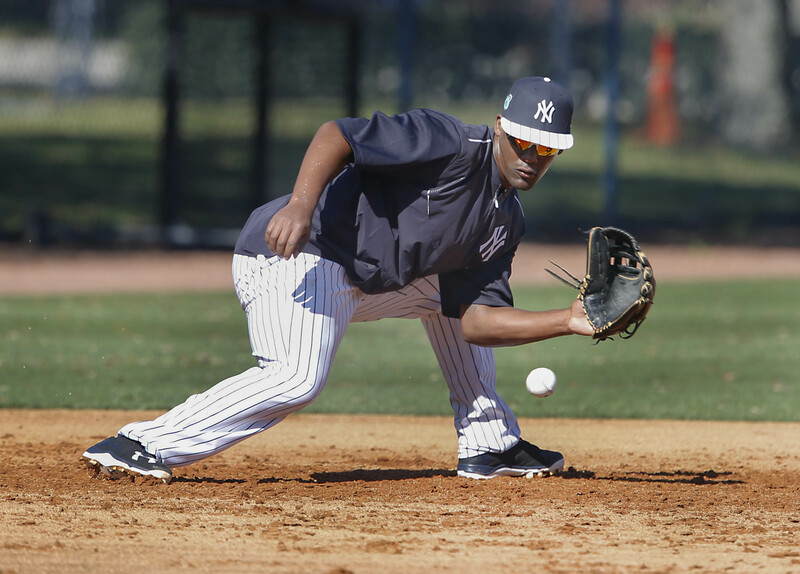 Miguel Andujar, once thought to be the future in the Bronx at the hot corner, was seen last Friday taking reps at first base before his game with the Triple-A Scranton/Wilkes Barre RailRiders. The Yankees have the third-worst production at first base this season and Andujar may be the Yankees answer to the potential problem rather than acquiring someone outside the organization. With prospects you have to make the organization see you and you have to force the organization’s hands by producing and Andujar has done just that as he crushed the ball in Double-A. Let’s be real, the long term plan for Andujar can’t be first base. His arm and defense is just too strong and too good (eventually anyway since he does lack true consistency in the field) to be wasted at first base. I truly think Andujar would be traded before he was moved to first base full time. Part time first base? Maybe, especially given the Yankees dire needs this season. I guess we will all just have to stay tuned.